Distance is defined as a scalar quantity, that is, it ignores direction and is only concerned with size or magnitude. It is the interval between points, and describes how much ground is actually covered between two or more points. Total distance would be calculated by adding all the intervals together. Unlike vector values, distance is never indicated using an arrow since only the size is counted, direction is not of concern. Distance is a physical quantity that can be measured, and it has specific units, either SI units (the metric system) or English units. In science we use the metric system, with the meter being the standard unit of length. The meter is defined as the distance that light travels in 1/299,792,458 of a second in a vacuum. Distance is speed multiplied by time. Since distance is related to both speed and time, if we know two of these values we can obtain the third. if we have time and distance we can determine speed. Distance can only be positive, and is an absolute value. Distance travelled can also sometimes be greater than the value for displacement. The distance can also be measured along a winding non-straight line. It does not necessarily have to be a linear measurement. Total distance is not the shortest path but the accumulated intervals, it does not matter where one starts or ends. Total distance covered would be the same regardless of how many times the direction changes, so one could move south, north, east or west. It would make no difference as you simply sum up the path to derive total distance travelled. Displacement is defined as the change in the position of an object taking into account both its starting and ending point. Movement is relative to a reference point, here relative to the starting point. Displacement is a vector quantity that has both magnitude and direction. In Physics, displacement is indicated using an arrow (vector). The arrow is drawn from the point at which an object starts from and ends where the object ends. while the arrow itself points in the direction of movement. Displacement can have both positive and negative values and can even be zero. It is about the change in position from the starting point, not the route travelled necessarily. Displacement is the shortest distance and path from start to end. An easy way to indicate displacement is then to simply draw an arrow from the starting point to the ending point across the shortest path. The SI unit for displacement is also the meter but unlike distance, it is always measured along a straight line. Since displacement takes change of direction into account, it can cancel out distance travelled. For instance if a person walks 10m west and then turns and walks back 10m to the east, displacement is 0. Walking in the exact same distance in the opposite direction cancels out the distance walked, hence no displacement. 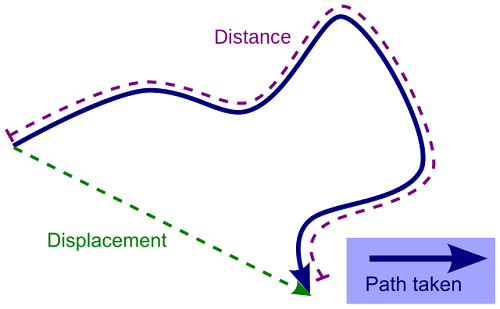 However, if the person walks 20m to the right, in a straight line, displacement will be equal to distance as here distance is the shortest path and is to the right so displacement is a positive value. An object could move in a circuitous fashion, but the displacement would be the straight line shortest distance from start to finish. In Physics, displacement is written Δx, where the Δ represents the change in spatial location and xo represents the starting point. A formula for displacement then would be: Δx = xf – xo. The final position is represented by xf . One always subtracts the initial starting point from the final ending point. Velocity is average speed and is thus based on change in position over change in time. It is also a vector quantity, thus it is calculated as the displacement divided by change in time. Distance is a scalar measure while displacement is a vector. Displacement is indicated with an arrow while distance is never indicated with an arrow. Distance only considers magnitude while displacement takes into account both magnitude and direction. Displacement can have both positive and negative values while distance can only have positive values. The symbol delta Δ is used for displacement while this is not the case for distance. Distance can be used to calculate speed given time, while displacement can be used to calculate velocity given change of distance (displacement), over time. Displacement is always measured along a straight line path, while distance can be measured along a non-straight path. Distance is a scalar measurement that only considers magnitude. Direction is not important. The standard metric unit of measurement for displacement and distance is the meter. Displacement is about change in position, it is a vector measurement in which an arrow is used to indicate both size and direction. Displacement is the shortest distance between two points. It can have a negative, positive or zero value. Distance is related to time and speed, hence speed can be determined if we know distance and time. Velocity is a change in speed and can be calculated from displacement. Dr. Rae Osborn. "Difference between Distance and Displacement." DifferenceBetween.net. October 24, 2017 < http://www.differencebetween.net/science/physics-science/difference-between-distance-and-displacement/ >. Urone, Paul Peter,Roger Hinrichs, Kim Dirks, and Manjula Sharma. College Physics. Houston: Rice University, 2012. Print.